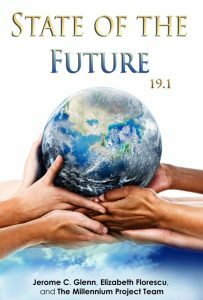 The State of the Future v.19.1 is a compelling overview of humanity’s present situation, challenges and opportunities, potentials for the future, and actions and policies that could improve humanity’s outlook – in clear, precise, and readable text with unparalleled breadth and depth. “We need hard-headed pragmatic idealists willing to understand the depths of human depravity and heights of human wisdom. We need serious, coherent, and integrated understandings of mega-problems and mega-opportunities to identify and implement strategies on the scale necessary to address global challenges”, says the Conclusions of the report. The Global Futures Intelligence System (GFIS) offers the full version of the State of the Future with ongoing updates to the 15 Global Challenges plus access to all The Millennium Project’s research and Futures Research Methodologies 3.0 (with 39 chapters). Over the years, the short overviews in each State of the Future report kept getting longer, and they became too long to say they are “short.” In this edition, they are shorter. We hope you like them. The longer “Short Overviews” with regional considerations will still be available free online and updated regularly in the GFIS, which is also available on your mobile phone, for just-in-time information. The prospects for humanity could be great, provided the main global challenges are addressed, shows the State of the Future produced by The Millennium Project. The State of the Future is a comprehensive overview of the present situation and prospects for humanity, integrating forecasts, trends, and judgments of thought leaders and scholars from around the world sharing important future possibilities to improve strategies today. The 2017 State of the Future Index shows that we are winning more than losing, so we have no right to be pessimistic; however, where we are losing is very serious, so we cannot fall asleep either. After updating global developments and trends within the 15 Global Challenges for over 20 years, it is clear that humanity has the means to avoid potential disasters described in this report and to build a great future. Pessimism is an intellectually cowardly position that need not prove anything and can stunt the growth of innovative idealistic minds. Yet idealism untested by pessimism or unaware of the depth and magnitude of global problems fosters naiveté that can waste our time—and time is not on our side. We need hard-headed pragmatic idealists willing to understand the depths of human depravity and heights of human wisdom. We need serious, coherent, and integrated understandings of mega-problems and mega-opportunities to identify and implement strategies on the scale necessary to address global challenges. Doing everything right to address climate change or counter organized crime in one country will not make enough of a difference if others do not act as well. The challenges we face are transnational in scope and trans-institutional in solution. We need coordinated transnational implementation. Government and corporate future strategy units are proliferating, but they have yet to sufficiently influence decisions on the scale and speed necessary to address the complex, integrated, and global nature of accelerating change. Intergovernmental organizations and public-private collaborations are also increasing, but they too have to become far more effective. Humanity needs a global, multifaceted, general long-term view of the future with bold long-range goals to excite the imagination and inspire international collaboration. Slowly but surely, a globally oriented planetary stewardship consciousness is emerging. Yet it may be too tolerant of the momentum of slow decisionmaking and glacial pace of cultural changes to improve our prospects. “Business as usual” future projections for water, food, unemployment, terrorism, organized crime, and environmental and information pollution lead to a series of complex human disasters. The stakes are too high to tolerate business as usual. The world is in a race between implementing ever-increasing ways to improve the human condition and the seemingly ever-increasing complexity and scale of global problems. The Executive Summary of the State of the Future 19.0 gives a clear and precise overview of our situation, prospects, and suggestions for building a better future, plus an annual World Report Card of where we are winning and losing, and the 2017 State of the Future Index. The section on the 15 Global Challenges provides a framework for understanding global change. The State of the Future Index (SOFI) section offers more details on how the SOFI is computed, graphs and forecsts for the 29 variables included in the SOFI, a sensitivity analysis of the 2017 SOFI, and a national applications for Pakistan. The chapter on Emerging Technologies for Potential Pre-detection of Terrorists and new Counter-terrorism Strategies presents some new approaches that could help identify potential terrorists and their plans as early as possible. It is a summary of an Advanced Research Workshop supported by NATO’s Science for Peace and Security Programme. This chapter summarizes the workshop’s outcomes and draws on material published in the subsequent book Identification of Potential Terrorists and Adversary Planning Emerging Technologies and New Counter-Terror Strategies. • What should we begin to do now to prevent long-term structural unemployment due to future technologies? • What questions need to be resolved to answer whether AI and other future technologies will create more jobs than they replace? • If massive unemployment cannot be prevented, what politicaleconomic changes would it be wise to begin to develop? Rich with data, analysis and forecasts, the State of the Future report is a unic “one-stop-shop” to understand the present situation and potential prospects in all the domains– from economy to demographics, S&T, climate change, democracy, and global ethics.